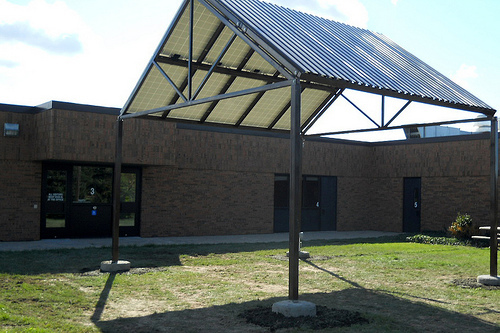 The Tuscola Technology Center has placed a high priority on green education. Students are provided with a custom designed energy "passport" where competencies are recorded as the students learn various aspects of alternative energy. The passports will be used as documentation to obtain credits at Delta College in Renewable Energy. The school has also shown a commitment to our future by installing two small wind turbines, converting a Ford pickup to an all electric vehicle, and using non-petroleum, eco-friendly inks. They have since welcomed a 2 kW Solar PV Pavilion to add to these green efforts. Since monitoring began 10/01/2010, this system has generated 643 kilowatt hours of clean energy.